Trying to figure out what size unit to rent can be frustrating and confusing. 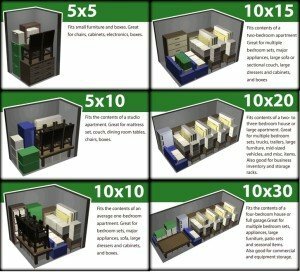 Here is a guide that will help you understand the different sizes that you can rent. Also, our on-site Managers will be glad to help you further by showing you the exact unit you will be renting and making sure you have a perfect match. 5′ x 5′ (25 Sq. Ft.) equivalent to a regular closet. 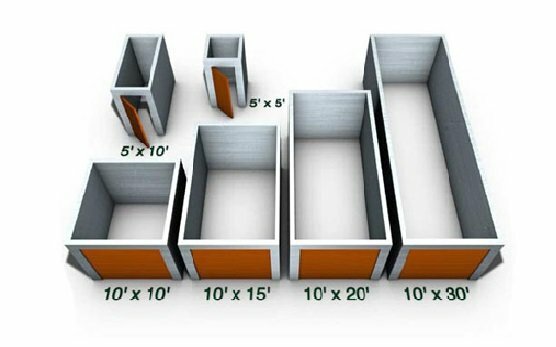 5’X10′ (50 Sq. Ft.) equivalent to a walk-in closet. 10’X10′ (100 Sq. Ft.) equivalent to a half of a one-car garage. 10’X15′ (150 Sq. Ft.) equivalent to a two-thirds of a one-car garage. 10’X20′ (200 Sq. Ft.) equivalent to a standard one-car garage.